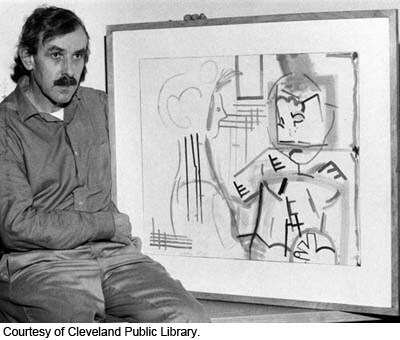 Joseph McCullough’s decision in 1957 to hire H. C. (“Carroll”) Cassill to replace retiring Paul Wilcox as head of printmaking at the Cleveland Institute of Art was the beginning of a new era for what had long been regarded as a minor art form. For, while painters had long since claimed the freedom to experiment with cubism and expressionism, Cassill would explain, printmakers were still turning out “nice little pictures of cathedrals.” To McCullough, who had been named director of the Institute two years earlier, the 28-year-old Cassill represented the future. As art students at the University of Iowa, both Cassill (a native of Percival, Iowa) and his young wife, Jean Kubota Cassill, had responded enthusiastically to the message of their teacher, Mauricio Lasansky, who believed the only limits to printmaking should be “the limits of art.” This extended to the techniques printmakers could employ. 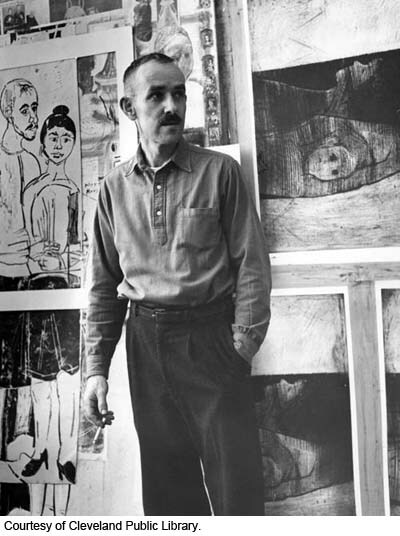 Cassill was only 19 and in his second year at Iowa in 1948 when he produced a satirical print titled The Sophisticate that was accepted for the exhibition New Directions in Intaglio at the Walker Art Center in Minneapolis—and purchased by the Museum of Modern Art (MOMA) for its collection. But Cassill wisely decided to complete the requirements for his bachelor’s degree, then his M.F.A., while continuing to experiment, now as Lasansky’s assistant, with combining various ways of working the plate. 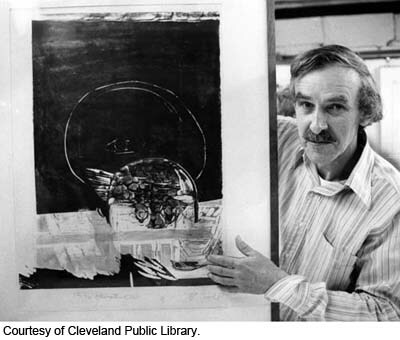 In 1953 Cassill was awarded a $2,000 Tiffany Fellowship in Printmaking and a teaching position. His work was soon taking prizes in important juried exhibitions, in several cases being purchased by the sponsoring institutions, which included the art museums of Brooklyn, Dayton, Denver, Oakland, San Francisco and Cleveland (which owns a dozen of his prints), and by the Library of Congress. Cassill’s intaglio prints, wood-cuts and lino-cuts also were seen in Barcelona, London, Belgrade, Salzburg, Hamburg, Munich, Vienna and Athens as part of three important traveling exhibitions, American Printmakers, an International Exhibition of Graphic Arts and the MOMA-sponsored Modern Art in the U.S.A., as well as at the Paris Biennial. Back home his work was being shown in such prestigious venues as Boston’s Museum of Fine Arts and the Metropolitan Museum of Art’s watercolor, print and drawing show. By 1966, Cassill’s work had been featured in some 45 group or one-man shows; by the time of his death at the age of 79, the number had reached a staggering 190 group and 19 one-man shows.